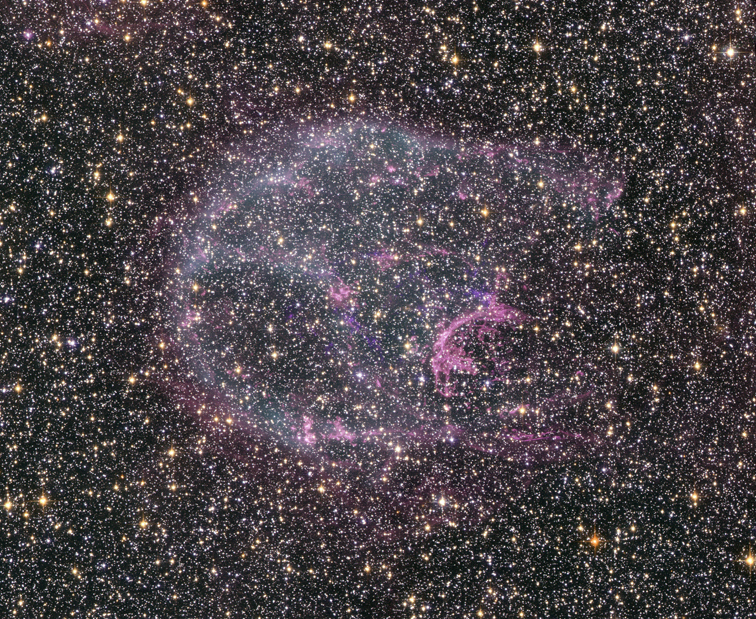 This beautiful image shows a glowing horseshoe-shaped cloud of hot gas against a backdrop of thousands of stars in the Large Magellanic Cloud, a nearby galaxy. 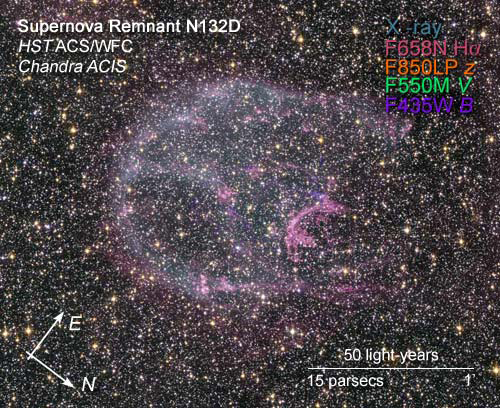 Observations with Chandra (X-ray/blue) and Hubble (optical/pink & purple) were used to make this composite image of N132D, a supernova remnant that was produced by the explosion of a massive star. The explosion sent shock waves rumbling through interstellar space at speeds of several million miles per hour. These shock waves, analogous to the sonic boom produced by supersonic motion of an airplane, produce sudden, large changes in pressure, and temperature behind the waves. The X-ray glow in this image is produced primarily by shock wave heating of interstellar gas to temperatures of about 10 million degrees Celsius. The horseshoe shape may have been caused by the uneven distribution of interstellar gas around the site of the explosion. Deep within the remnant, the Hubble optical image reveals a smaller, bright crescent-shaped cloud of emission from hydrogen gas, and faint purple wisps that correspond to regions rich in oxygen atoms. These wisps provide evidence of the manufacture of oxygen and other elements such as carbon by nuclear reactions in the core of the pre-supernova star. These and other heavy elements are dispersed by the explosion and millions of years later could be incorporated into new generations of stars and their accompanying planets. The star that exploded as a supernova to produce N132D was probably more than 20 times as massive as the Sun. Most of the stars in this image are less massive and will not go out with a bang. By comparison with N132D, they will go quietly into the night as they eventually fade away to become white dwarf stars.